Learn how to configure the bandwidth cap (quota) that a consumer can upload or download at any given time. A Bandwidth Quota Policy is a Quality of Service (QoS) Policy that allows you to configure the bandwidth cap (quota) that a consumer can upload or download at any given time. You can specify the bandwidth cap as kilobytes or megabytes per second. If the quota is exceeded, the runtime throttles the traffic to conform to the quota policy. You can assign the quote to the request (upload) or the response (download). Note: No alerts are generated for this policy, since the bandwidth consumed is a function of the network speed and capabilities of the service provider, not the consumer. Name: A read-only field that displays the name of the Bandwidth Quota Policy. Description: A read-only field that displays the description of the Bandwidth Quota Policy. Bandwidth Limit: A field display and drop-down list box combination that allows you to specify the bandwidth limit and select the data transfer rate from the drop-down list box (kilobytes or megabytes). Request / Response: A radio button that allows you to select whether the defined bandwidth quota applies to the uploads (request), or downloads (response). Let's take a quick walkthrough of the Bandwidth Quota Policy configuration process to get you started. 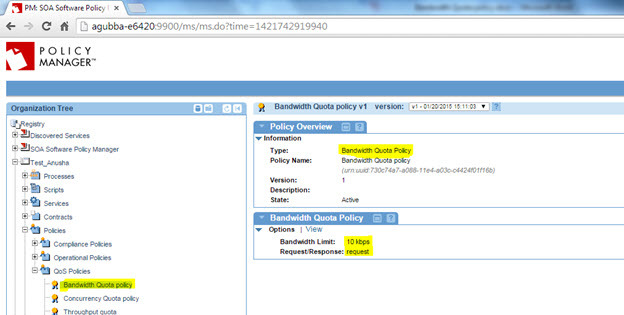 In Policy Manager, to create a Bandwidth Quota Policy instance, go to Policies > QoS Policies and choose Add Policy. After you've attached the Bandwidth Quota Policy to a web service, operation, or binding, send a request to your service and go to the Services > Monitoring section to view the results for Logs, Real Time Charts, and Historical Charts. For more information on using the monitoring functions, refer to the Policy Manager Online Help, available via the Help button. This section provides a list of Policy Manager-specific usage scenarios for the Bandwidth Quota Policy. Throttle the incoming upload traffic to conform to the specified network speed limit of 10KBPS for given service capabilities. 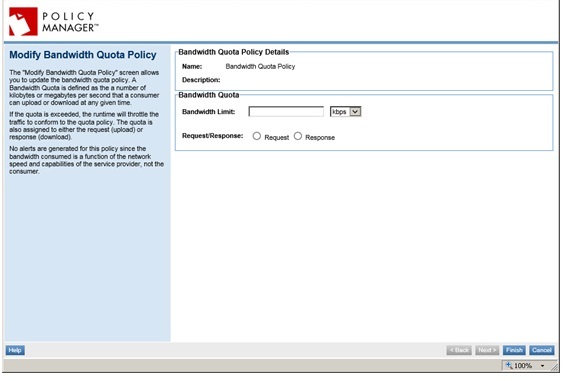 Navigate to Organization > Policies > QOS Policies and use Add Policy to create a Bandwidth Quota Policy. Configure the policy with 10kbps bandwidth limit assigned to the request. Activate the policy in the Policy Workflow portlet and attach it to the Vs1 service in the Service Details > Policy Attachments > QoS section. The policy throttles the input such that the upload speed does not exceed 10kbps. As a result, the requests hit the service at slower rates and the load on the server hosting the service is reduced. Throttle the outgoing download traffic to conform to the specified network speed limit of 1KBPS for given service capabilities. Configure the policy with 1kbps bandwidth limit assigned to the response. The policy throttles the output so that the download speed does not exceed 1kbps. As a result, the response time might vary greatly when there is a huge load on the service. This section provides a list of Community Manager-specific usage scenarios for the Bandwidth Quota Policy. Scenario 1: How Do I Verify Bandwidth Quota Policy? If you are using a Bandwidth Quota Policy with Community Manager, you must first add the policy to the Community Manager Tenant Organization in Policy Manager. Once that's done, it will be available for selection in the developer portal. Go to Tenant Organization > Policies > QoS Policies and click Add Policy. 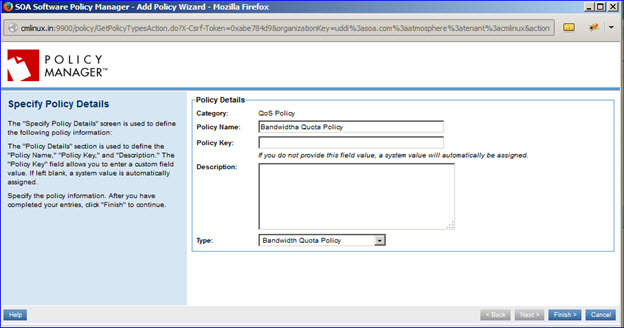 Specify Policy Name, Policy Type (Bandwidth Quota Policy), click Finish, and then click Close. 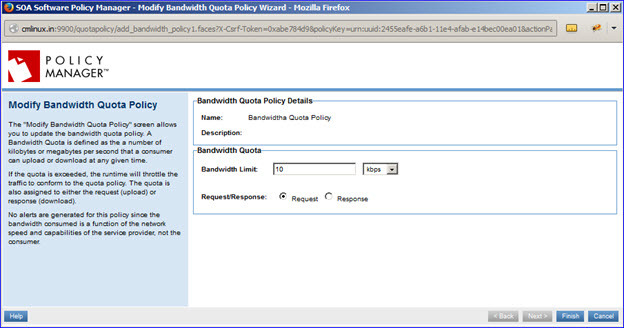 On the Bandwidth Quota Policy Details screen, click Modify. Provide the policy details. You can configure this policy for request or response. 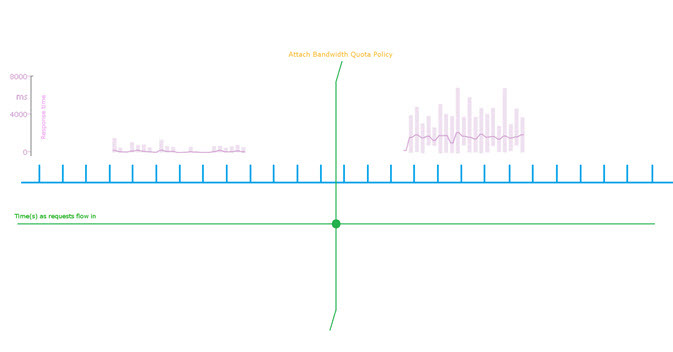 Configure it with small bandwidth (for example, 1 kb, 10kb) so that you will see the policy behavior immediately. click Finish. Attach the Bandwidth Quota Policy to the API Implementation. Go to Test Client and send requests. 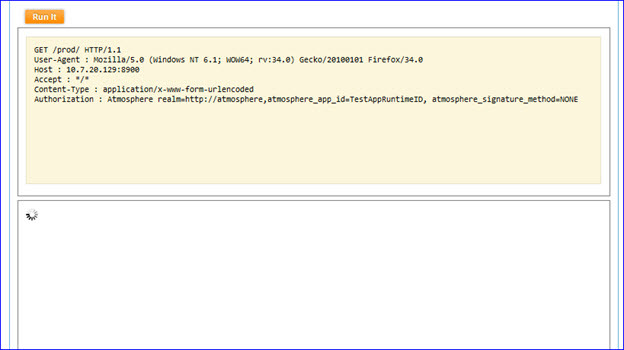 Once the upload/download exceeds the specified limit, runtime throttles as shown below. Note that this policy does not generate alerts.